If you know The Princess Bride, these references will mean something to you. If not, and your friends drag you along, I highly anticipate that while you might not understand all the interactive preamble, you will leave the event with an abiding affection for the movie that I loved as a child, and love still. 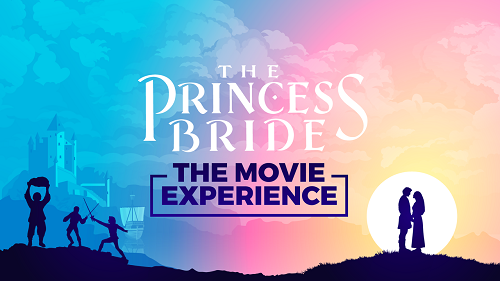 Many movies from the 80’s don’t hold up anymore, but The Princess Bride is a wonderful exception. The performers in this show obviously share my feelings. The scenes they played were done with such attention to detail that, for example, even though they don’t have the resources for a fully believable double-ambidextrous sword-fight, that scene was still exciting and hilarious. It was also a bit touching, as it is in the film, but even more so because the performers are so committed to the characters from a 30-year-old comedy. The performers seem ideally suited to their respective characters in every way. Whether it’s the bravado of Inigo, the bickering of Miracle Max and his wife Valerie, or the fact that they found an actual giant to play Fezzik (originally portrayed by Andre The Giant), I want to give the entire creative team a hug for their care. Performance spaces are set up not just on the stage but on the sides at the back, so you do have to twist around a bit to see it all. Some action happens in the aisles, so if you find your folding chair has more space in front of it than it does behind, don’t edge it up yourself as I did. Costumes are encouraged, and it did add to the charm of the event to see a motley crew of princesses, swordsmen and pirates in the audience. It’s not a requirement, but if you have a mask hanging around, I encourage you to bring it. Nothing feels too silly once you’re inside, and I found it entirely delightful to travel back to a time when tiny Fred Savage and I reveled in fighting and adventure and jokes — and maybe we could stand some of the kissing parts too.